Four-Eyes is a dedicated four channel VU metering device designed for usage in both pro and semi-pro ( or Hi-Fi) situations. 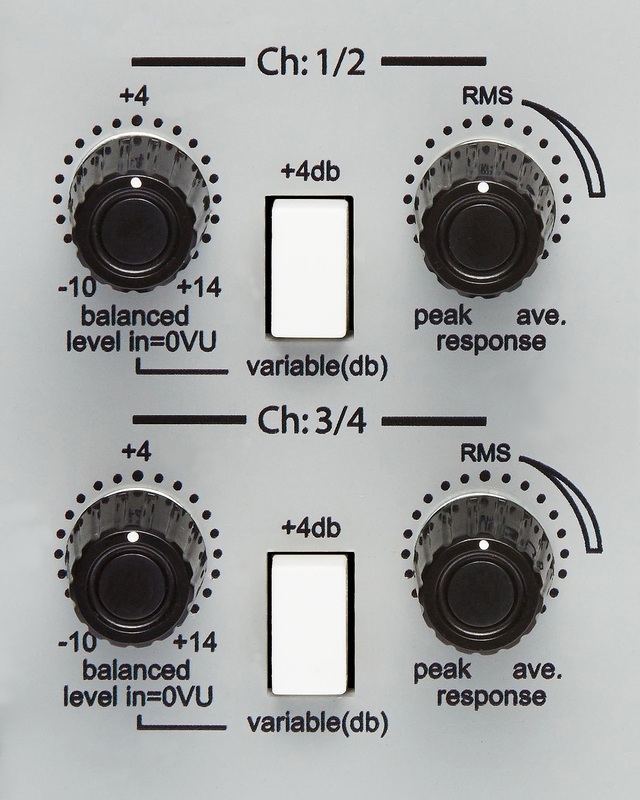 Each VU meter is driven by its own set of buffers so that there is no load on the audio signal. VU levels can be visually monitored at either the preset standard of +4dbu=0dbVU or switched to a variable level so that the user may assign a 0dbVU reference point. When switched to variable the 0dbVU point can be assigned to be anywhere from -10dbu to +10dbu. This is useful if the user wishes to move the VU meter scale up for digital recording for example or move the VU meter scale down for an appropriate reading for -10dbu calibrated equipment or even domestic Hi-Fi. Meter response time is also variable from Peak to RMS to approx 1sec average. This is handy when trying to optimize the dynamic range of various equipment and of value when trying to maximize the overall loudness by reading the average energy of a track as opposed to its transient or peak reading. These adjustments are made in two groups of two i.e channels one and two are linked and channels three and four are linked. This facilitates easier and faster set up times as well as easy matching between all four channels. The two groups of inputs are also auto-linked so that if the user desires to set up a peak mix visual on the left and an average visual on the right only one set of inputs and leads is required. The unit itself is built into a rugged 2U powder coated mild steel case with a 3mm mild steel powder coated front panel. Power supply is internal and switchable from 120VAC to 240VAC.